If there is something Sao Paulo does well, it is a good old-fashioned market. Every neighborhood in this sprawling metropolis has at least one weekly street fair to call its own, where locals can buy fresh fruits, vegetables, fish, and spices. From traditional farmers’ markets with an incredible variety of produce to charming antique fairs where you can find the perfect souvenir, the city has something for everyone. 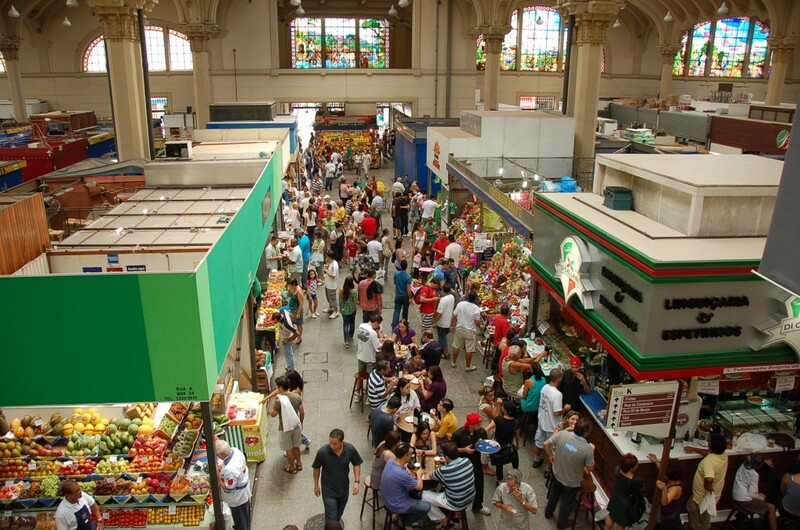 Here are some of the best markets Sao Paulo has to offer. The city’s Municipal Market, commonly known as the Mercadão (or “Big Market”), is a mainstay on any list of the top things to see and do in Sao Paulo. The market, located in the old center of the city, attracts large crowds every day. The ground floor has hundreds of stalls selling fruit, vegetables, spices, and cured meats, while there is an upper level with a number of charming restaurants. Hocca Bar is the most popular, serving the Mercadão’s famous mortadella sandwich and pastel de bacalhau, a deep-fried thin crust pie filled with salt cod. Located in the trendy neighborhood of Pinheiros in Sao Paulo’s west zone, the Mercado Municipal de Pinheiros is an excellent option for anyone looking to buy superb produce and rare ingredients sourced from all over Brazil. The market has been functioning at its current address since 1971, but only in the last few years has it undergone a dramatic renovation, with renowned chefs Alex Atala, Rodrigo Oliveira, and Checho Gonzales moving in and opening their own stalls and restaurants. Comedoria Gonzales, owned by the aforementioned Checho Gonzales, is a must-visit as it serves one of the best ceviches in Sao Paulo. 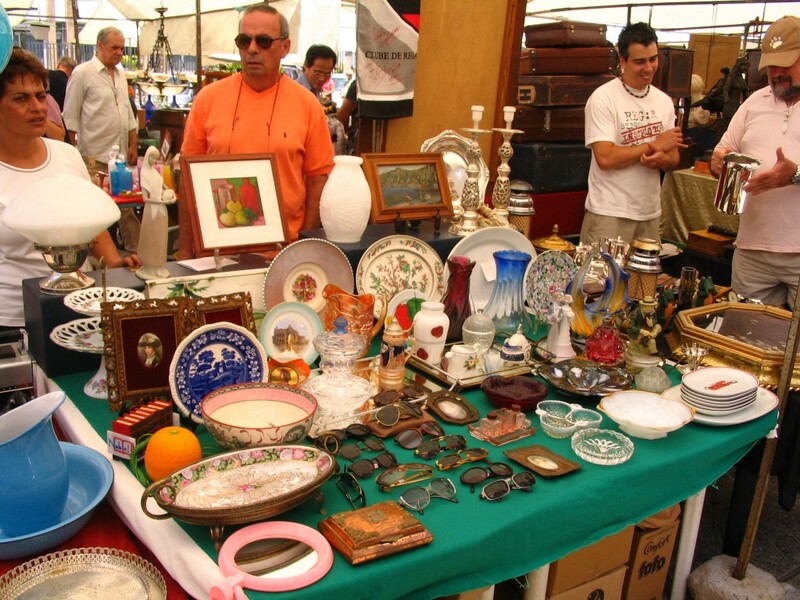 A short walk from the Mercado Municipal de Pinheiros is the charming Benedito Calixto Square, which hosts one of the most charming arts and antique fairs in Sao Paulo every Saturday from 9 AM to 7 PM. The stalls sell a little bit of everything, from vinyl records and clothes to antique furniture and children’s toys. There is also live music and food, meaning Benedito Calixto is an excellent place to spend a sunny Saturday. 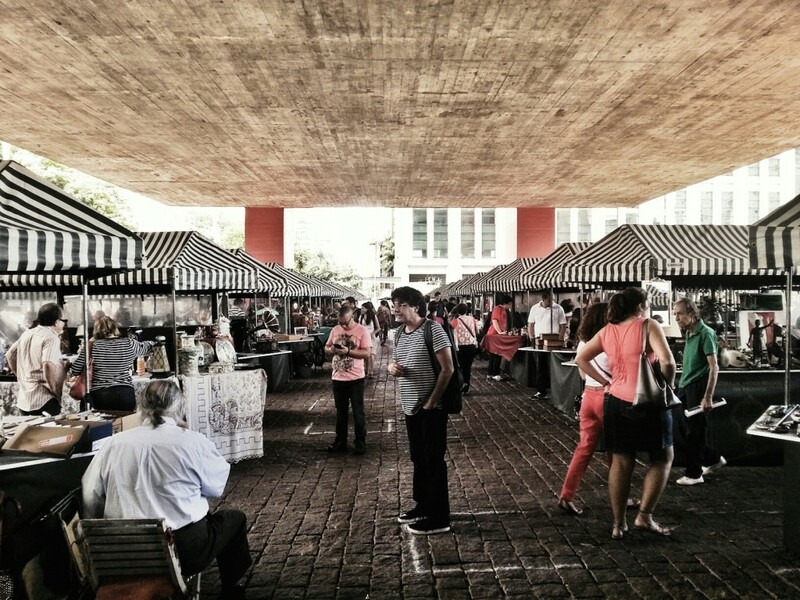 One of Sao Paulo’s most popular markets takes place every Sunday underneath MASP, the city’s most famous art gallery. The impressive museum, designed by Brazilian architect Lina Bo Bardi, is made of glass and concrete and suspended above ground level by large beams. Therefore, the area underneath MASP is left free, often serving as a meeting place for cultural events. On Sunday, however, the free space is devoted to the MASP Antique Fair, which receives around 5,000 visitors each week and has been running for over 25 years. The stalls offer all kinds of unique items, including antique clocks, jewelry, plus arts and crafts. 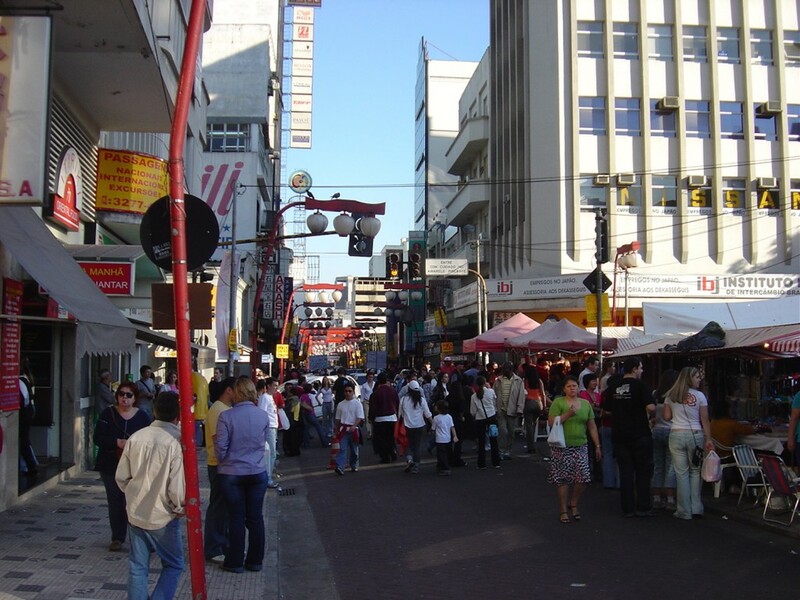 Sao Paulo has the largest concentration of Japanese people outside of Japan, and nowhere is that more evident than in the central neighborhood of Liberdade, Sao Paulo’s very own Japantown. With its roads lined with oriental suzuran-to streetlights, the neighborhood has a distinctly East Asian feel year-round. However, it is on the weekends that Liberdade celebrates its heritage with its arts, crafts and culture fair. From 8 AM to 7 PM every Saturday and Sunday, stalls sell traditional Japanese ornaments, jewelry, and clothing. There are also plenty of stands selling Asian street food. While it is among the largest immigrant communities in the cosmopolitan metropolis of Sao Paulo, many people often overlook the city’s Bolivian population, and their culture is certainly not as celebrated as the Italian or Japanese in Sao Paulo. 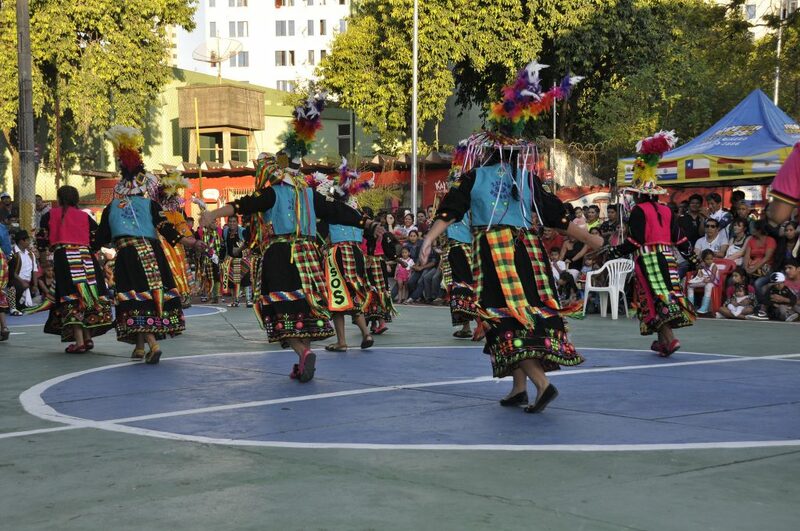 In the northern neighborhood of Canindé, where many Bolivian families live, the fair held every week at Kantuta Square is the best way to get an authentic experience of Bolivian culture in Sao Paulo. Held every Sunday between 11 AM and 7 PM, the fair hosts a number of stalls selling Bolivian food, ornaments, and authentic textiles. If you’re lucky, you might even catch a traditional Bolivian dance display.